Ram Charan’s most anticipated flick, ‘Govindudu Andarivadele’ is creating a huge buzz all over. Directed by Krishna Vamsi, this film features Kajal as the female lead. 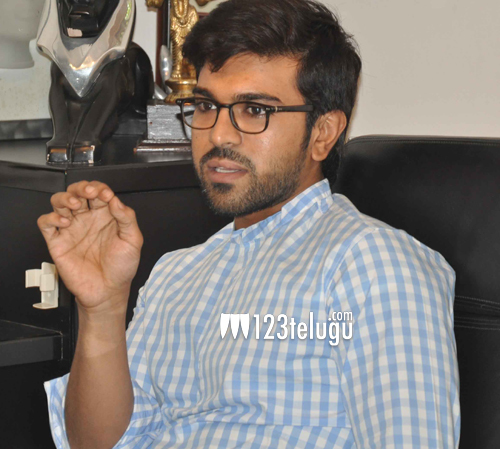 On the eve of the film’s release, we caught up with Ram Charan for a detailed interview. Let’s see what he has to say. Q) What attracted you towards this project ? After ‘Magadheera’, I was looking for a simple family oriented script. Though, few directors narrated me some stories, I was not impressed with them. But when Krishna Vamsi approached me with GAV, I was totally impressed and went ahead with the project. Q) Why did you choose Krishna Vamsi, who is going through a lean phase ? I never went behind successful directors or writers in my career. Coming to Krishna Vamsi, he was never a failure director, only some of the recent projects that he made did not click. Q) What did you learn from Krishna Vamsi during the making of this film ? One of the most important things that I have learnt from him is that we can create a lot of impact while dubbing for the film. Krishna Vamsi is one of the best directors, who completely believes in the script, and never compromises on any issues. Q) How was it working with Kajal for the fourth time ? I feel very comfortable working with her. In GAV, you will see a totally different and beautiful Kajal Agarwal. Q) How has the presence of Paruchuri brothers helped this project ? Though Krishna Vamsi gave the story, and even wrote 80 percent of the screenplay, Paruchuri brothers gave a makeover to the script. They gave the much needed emotional touches and wrote extra ordinary dialogues. Q) How has Prakash Raj’s inclusion worked out for the film ? Prakash Raj has given his heart and soul for this movie. All our scenes have come out extremely well and will be the major highlight of the film. Q) There are six songs in the album, but you are releasing the film with only five songs. What is the reason behind this ? We have removed one song as we thought it is disturbing the flow of the film. But as that song is my favorite, we might include it from the 12th or 13th day after the release. Q) There are rumors that GAV will be on the lines of ‘Seetharamyya Gari Manumaralu’. Can you please comment on this ? Even though GAV looks like an inspiration from that film, our movie will have a new story, screenplay and different taking. Q) Why did your movie with Koratala Shiva get stalled ? I only take advance from producers when the script is finalized. But in this case, the story was not finalized, and Bandla Ganesh forced me to go ahead with the mahurat as it was an auspicious date. But some how things did not work out and the project got stalled. Q) You have received a negative feedback from critics for your Bollywood entry. How did you take it ? I heard a lot of negative feedback for ‘Zanjeer’ and accepted it with open arms. We are planning for one more Bollywood film and hopefully, I will prove myself with that film. Q) We have heard that many top directors have narrated you their scripts. Did you ok any of them ? Srinu Vaitla narrated me a story, but nothing has been confirmed yet. Mani Ratnam has also narrated a line but once again, things did not work out. There is a commitment with Gautham Menon, and once he finishes his other projects, we may work together. Q) What is the status of your dads 150th film? We have heard many scripts and shortlisted three of them. Now we have to select one out of those, and I myself will produce it. Q) Finally, there is a phobia for Tollywood heroes that their 8th film turns out to be a huge flop. What do you have to say about this ? Actually, I was not aware of this until my manager told me. But I will break this phobia of 8th film flop with GAV. I am very much confident about the film’s success. With that we wrapped up our interview with Ram Charan, and wished him all the best for GAV.